TS Royalist is the flagship of the Sea Cadet Corps. A 29m square rigged brig, she has taken thousands of Sea Cadets to sea a week at a time. I first sailed on her in November 1993 for the residential project of my Gold Duke of Edinburgh’s Award. Although a Watch Officer and therefore a member of the adult crew looking after the Sea Cadets, both the Sea Cadet ethos and square rig sailing were completely new to me. Those in charge felt I hadn’t gelled enough to pass the residential project, instead suggesting a Watch Officer’s training course. Undeterred, I attended my Watch Officer’s training course the following May. I found out years later that they had never expected to see me again, so they were somewhat surprised to see me. Sailing as a yardsman, I was the youngest member of the crew. Sailing out of the Channel Islands in a Force 5, who was out on the top yard so that we could set the topgallant? Oh yes, that was me. I loved it, passed the course, and joined the Sea Cadet Corps as an Instructor the following week. There followed several weeks sailing as Watch Officer over several years. I also qualified as an RYA Day Skipper while sailing as Mate in some of their smaller yachts – so boats that have winches aren’t entirely new to me! 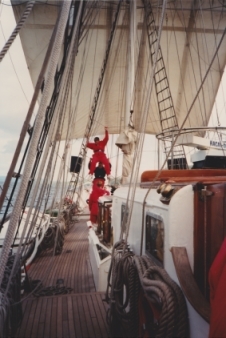 I left the Corps in 2001 but continued sailing in TS Royalist until 2004. My final week as Watch Officer resulted in a phone call to my boss asking if I could take the next week off. Why are you calling me on your holiday? Because I don’t want to come back next week! You see, TS Royalist could not sail without a Coxswain. The Relief Coxswain that week was me. © Anita Davies and http://anitasailsagain.com The blog post above first appeared on http://anitasailsagain.com, and is subject to copyright. If you can see this message it probably means that the content has been copied without permission, in violation of that copyright. To see this post within the context that was intended, please enter http://anitasailsagain.com into your browser. Full copyright notice, as displayed on site: © Anita Davies and http://anitasailsagain.com, 2013. Unauthorized use and/or duplication of this material without express and written permission from this blog’s author and/or owner is strictly prohibited. Excerpts and links may be used, provided that full and clear credit is given to Anita Davies and http://anitasailsagain.com with appropriate and specific direction to the original content. AnitaSailsAgain by Anita Davies is licensed under a Creative Commons Attribution-NonCommercial-NoDerivs 3.0 Unported License. Based on a work at http://anitasailsagain.com.